Since today was a travel day, I got to go through several newspapers. Many national journalists claim they read four or five a day, but I don't read that fast. It used to make me feel guilty that I barely ever got through the local newspaper, let alone fill up on USAT, NYT, WSJ, WP, LAT and whatever else the fancy people pretend they read cover to cover. Then I lived in China and had no access to Western newspapers or an unfiltered Internet and realized I could function just fine as a journalist without all that -- and without the guilt. * The Las Vegas Sun had a terrific piece by the very talented Kristen Peterson about a crappy downtown motel that got a big facelift and is now going after a boutique-hotel market niche. It's just crazy enough to work; I'm smelling a story in that one for me, actually. Peterson is consistently the best writer on fine arts and architecture in town and deserves more than the back-of-the-insert real estate she is often relegated to. * The Wall Street Journal, aside from continuing to bring out more damaging information about possibly wrongdoings by Nev. Gov. Jim Gibbons and his wife (dissected on Hugh Jackson's Las Vegas Gleaner site today), had a fascinating center-column piece on miracle fruit -- no, really, that's its name -- from Africa that makes sour things taste sweet. The piece is here but since you can't get it online unless you're a registered subscriber, just go here and read about it on the Eatfoo.Com blog which is written by one of the key sources in the story. * The Las Vegas Review-Journal's Benjamin Spillman had a good story about a tourism conference focusing on rural Nevada (but held, evidently, in Primm, just outside Vegas.) What amused/fascinated/saddened me about this was the poor soul from the Elko tourism board sort of admitting that the only way to attract, say, Chinese tourists, is to help them pretend like they have business in Elko's gold mines in order to get visas to come to the US&A. The logic was bizarre, but the thrust was clear: There is no legit reason why almost anyone would want to go to Elko for a vacation, least of all overseas travelers. Just give up already and give Vegas your water. Now THAT'S a picture window! 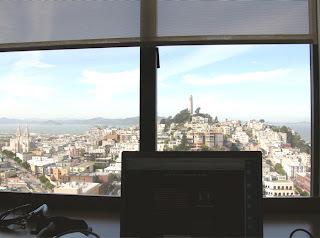 This is the view out my window right now in San Francisco. Telegraph Hill ahead, Alcatraz out there to the left a bit, the Golden Gate Bridge presumably just around the bend. Apparently I got my room assignment BEFORE that fruity front-desk guy asked me with a suggestive wink who "Miles Smith," the other name on the room, might be. When I told him, he deflated but the keys were already in hand! I swear this blog won't always be about our travels, it just happened to be born as we were about to do a lot of it. 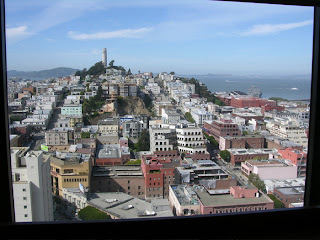 Fresh off the honeymoon, I had this weekend to head to San Francisco for the meetings of board members and chapter presidents of the National Lesbian and Gay Journalists Assn and I love this city, so I didn't want to pass up an expense-paid trip here. (I'm an ex-board member, current Vegas chapter prez.) We also had a free Southwest ticket that would expire next week, so Miles will join me tomorrow after my meetings for a couple of days for what must be the earliest second honeymoon in marital history. All that went away when I walked into this room at the Hilton SF Financial District (which, as Gregory Zephyr of the AnythingSF podcast noted of his weekly show was renamed very recently from Holiday Inn Chinatown without actually moving the building.) This view was worth getting up and going for again, and now I can't wait for Miles to have the same response. What's more, this hotel is so happy to have the NLGJA's business that they left a nifty swag bag that includes a notebook, a Ghiradelli mint chocolate bar and some binoculars. Not clear yet whether we get to keep those, although it seems like it. Oddly, the bag also contained a couple of small swaths of blue fabric in a tiny plastic ziplock bag. Not a clue why. The latest episode of "The Strip" is up with lengthy discussion of our wedding, honeymoon and reaction to one homophobic -- but evidently devoted -- listener. Also, there's a fun interview with Lance Burton on the spate of new magic shows that are opening or have been announced for The Strip. Lance also discusses his own involvement in the dualing magician flick "The Prestige" starring Hugh Jackman and Christian Bale. Plus, we discuss Legoland Vegas, the Grand Canyon Skywalk and the news that Miss America lost its TV contract yet again. Listen by clicking here -- or right-click here to download the file and listen to it at your leisure. Allison Hoffman of the Associated Press had a great story. I mean, how cool is it that they replicated 10 Vegas casinos with Legos -- complete with figures of annoying men pushing prostitution fliers. Look at this picture of it -- cool, huh? Sadly, she spent about 12 seconds thinking up a lead to her story and became just the latest hack to take the intellectually brain-dead, most cliched approach to a Vegas story imaginable. Are you ready for it? CARLSBAD, Calif. -- What happens in Legoland Las Vegas will stay in Legoland Las Vegas -- if the designers have anything to say about it. The worst part is, it's not even true! The Legoland folks want EVERYONE to talk about it, want EVERYONE to take pictures, want EVERYONE to go forth and discuss. That's why they put out this Video News Release! Los Angeles evidently is feeling a little bit lacking these days. To gin up their bid for the 2016 Summer Games, they've been hanging in Vegas trying to see if they can get a little reflective neon glow to add to the offer. That is they want to hold some soccer games at Sam Boyd Stadium. The mayor and the LVCVA are predictably ga-ga, although the weatherman is concerned about a half-million fans watching soccer outside in the Vegas summer. Will discuss this and more tonight on "The Strip," but we are curious what you think. Does this make sense? Listen to the live show and join the chat at LVRocks.Com. Join us from 7-8 pm PT. These are my feet in funny footies. 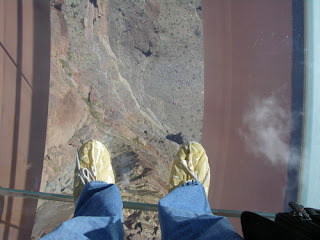 That's 4,000 feet of Grand Canyon beneath me, a thin but sturdy sheet of glass separating us. That window-in-the-floor at the Palms' ghostbar has nothing on this. 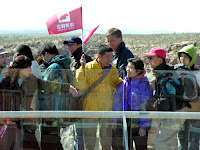 And this is a photo you won't be able to get of yourself on the newly opened $30 million Grand Canyon SkyWalk because they won't let you bring your own camera or much of anything out there. So rip this off and tell everyone it's you if you like. I won't tell. They may have allowed these people to have cameras today, I can't recall, but that's because the place was thick with journalists, too, so maybe they were more lenient. I am exhausted. Today's trip out for the Christian Science Monitor was long and arduous, and if it doesn't get shorter and less arduous, it's destined for failure. I woke at 5 a.m., left at 5:30, got there finally at about 8:30ish. As it stands right now, the West Rim is only about 120 miles from Vegas, but it's a treacherous drive that requires you to pass over the parking lot that is the Hoover Dam and then drive about 30 miles of extremely difficult, bumpy, unpaved terrain that my '98 Chrysler Sebring was not pleased with. And that only gets you to the depot where you have to take a shuttle bus to Eagle Point, where the $30 million horseshoe-shaped glass walkway juts out from the rock. It's better to go with a tour operator and, if possible, by helicopter, but that's expensive. So there are some kinks. Also, it was snowing, at least when we arrived. But that's not their fault. I was the dunderhead who has started listening to podcasts so much that I don't even ever listen to the local weather report on the radio. And that cost me, since when I arrived in a dress shirt and jeans I was so frigid I bought that hideous brown hoodie for $36. Oh, and the credit card thing wasn't working when I tried to buy it, so I had to pay cash. Which left me with about $1.27 in my pocket. 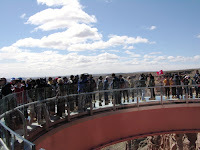 The deal with the SkyWalk is that it was financed by a group of Vegas businessmen on Hualapai reservation land in a deal that is supposed to generate all kinds of riches for the impoverished Native Americans who live, largely, in a desolate Route 66 outpost called Peach Springs about 50 miles from the site. 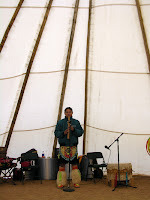 The Hualapais are said to be very poor, although it really depends on whom you ask. But I'll get to that in a moment. The SkyWalk itself was, undeniably, cool. You're forced to wear these hospital-ICU-style glass-walkway-scratch-preventing footies that you can see in the glass reflection on the picture of me here (Fun fact: they considered making them purple but went with the earth tone to "fit in with the environs") and it does feel weird for about a split second to walk out on it but that goes away quickly. The development is in its infancy -- a major visitors center is planned, plus an array of educational Native American exhibits including such things as tipis with people like this poor schlub acting all native and all. That bit of it, I must admit, seemed a little exploitative. I asked some manager if his attire is how he normally dresses and she snapped at me as if such a comment was ignorant or racist. But hey, what should I think when he's on display like this? There are a few controversies surrounding this project - questions about whether building this way is appropriate, whether it will bring hoards of rude, dirty, polluting tourists to a pristine natural landmark, whether it will generate revenue for the Hualapai tribe, whether they can really compete with other, more visually eye-popping sections of the canyon at the South Rim. I'll deal with all of this in my story, whenever it's out. doing a stand-up bit but later morphed into the least likely part of a Chinese tour group (right). Ask Miles what "Ni hao, xiang mao" means, Tom! Anyhow, I've got to write my piece on this whole thing but wanted to offer up some pictures. 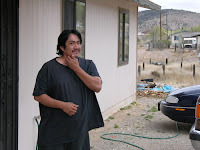 I left by noon after interviewing many impressed -- and one or two less impressed -- tourists and the muckety-mucks involved, then took the 2-hour, 49-mile, death-defying, unpaved, frightfully hilly drive to Peach Springs to see just how poor the Hualapai folks really are. Yes, it was a sad town in some ways -- very reminiscent of the depressed Route 66 town in the movie "Cars" -- but many people there bristle at the notion that they're as poor as the SkyWalk folks are saying. That said, I interviewed this fellow for my piece and he wanted to get a job at the SkyWalk. He was rejected because he failed the drug test. And I imagine that's a pretty common situation out here. 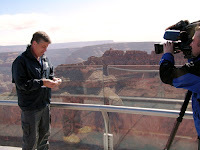 I'm off at this miserable hour to the West Rim of the Grand Canyon for a story on - what else? 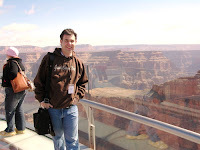 - the Grand Canyon Skywalk. Will have pix and thoughts upon return much later today if I don't fall through the glass and go bye-bye. Molly and Emily interview the producer of the Puppy Bowl. I was away. Aww... Click here to listen. Stop the presses: The Silverton Put Up A Sign! This just struck us as a bit sad. The Silverton, which is a quite respectable little hunting-lodge-themed joint with an excellent cafe and a ginormous Bass Pro Shop a couple miles south of the Strip, added a huge new marquee. Fine. That's nice. Probably a good business idea. On Thursday, March 22, the Silverton Casino Lodge will install a huge 54' sign on the west corner of Dean Martin and Blue Diamond. This new sign is sure to draw attention to the booming locals casino. The Silverton Casino Lodge would like to extend an invitation for any media interested to come out and take as many photos and as much video of the sign as they would like. We've been looking all over and it seems that "as many photos and as much video" has amounted to exactly nothing. OK, it's hard to tell at this late date whether any of the TV stations pandered. But we couldn't find a single photo anywhere on ye olde Internet of this sign, not even on the Silverton's own website, and it does appear that this momentous event seemed to be covered by, uh, nobody. Meet Rep. David Guttenberg, D-Fairbanks. We didn't, but we feel like we know him and his mustache. But let's start from the beginning. 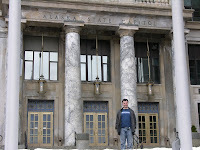 We pull up to the Alaska State Capitol in a frigid downpour shortly after noon today and it’s confusing where to park and where to enter. The place is pretty quiet since it’s Sunday, so we pull into a back lot for legislators which is, by and large, empty, as you can see in these pictures. As it happened, the inside of this Capitol held our interest for about 20 minutes, largely because an energetic, somewhat flamboyant security guard charmed us into taking interest in a few bits, namely a state seal made of locally mined gold, that we would have otherwise overlooked. When I emerged, I noticed a wet piece of paper on the back window. It fell apart when I tried to pick it off to see what it said. 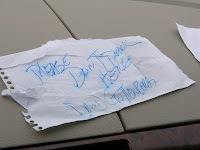 But we have a pretty good idea what it was – based on these other two notes Miles had already found on the car. To your left, see the handwritten one by Minority Whip Rep. David Guttenberg of D-Fairbanks. To the right, see the printed out one. Click on them to make them bigger if you can't see it this way. Let’s take just a moment to point out the obvious here. There was a lot full of empty spaces. And yes, we acknowledge that we shouldn’t have parked there, but we couldn’t have known that we'd displace a deranged legislator. 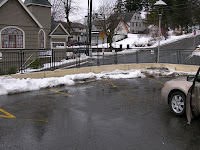 And not just any deranged legislator but one so proprietary about his parking space that he first stands in the rain and writes a note to the offender who forced him to park a few paces away on a dead afternoon. And then, perhaps worried that the rain would wash away that missive, Rep. Guttenberg went to his office (apparently on the fourth floor, according to the state's website) to print out another note about his parking crisis and, probably, a third, although it fell apart in my fingers so thank GOD he covered his bases with the others. One shudders to ask oneself what important piece of state business wasn't getting done while Rep. Guttenberg plotted his maniacal revenge over this injustice! Alaska, we love you. You’ve been nothing but terrific to us. We even picked out an adorable two-bedroom with hardwood floors and killer glacier views in Palmer we'd move into in a heartbeat if only your media market was big enough for either of us. We loved our visit and, as weird as this makes us, your weather so much. But Rep. Guttenberg, get a life. Everyone told us not to bother with Juneau, that there was nothing there, but I'm a state capital aficionado, so we spent an extra 25,000 frequent flier miles to arrange for a stop here before we return to the "Lower 48" on Monday. Well, it's a truly, truly charming spot. I hadn't realized it, but it's a rain forest. They get 220 days of rain or snow a year. And it's raining here now -- some sort of a heat wave has brought the mercury up to 36. It was 5, by the way, when we got in the car in Anchorage from the motel heading to the airport. * The first billboard you see heading to baggage is a cryptic political message from Planned Parenthood of Juneau saying: "We're pro-child, pro-choice, pro-something else, pro-privacy." Hmm. Welcome, everyone and abortion-seekers! 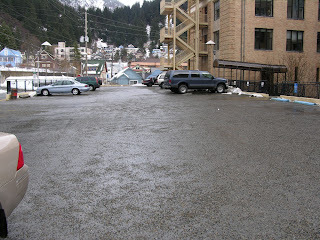 * Juneau happens to be the largest state capital by square mile. * In among the literature about the statehouse, the glacier tours and so on was a tri-fold brochure for the Refenstein Dialysis center. In fact, it's also on this Tourism Juneau website, complete with a "add to favorites" link should anyone possibly want one. There are pretty pictures of mountains, glaciers and bears. And testimonials like: "Having the Reifenstein Dialysis clinic open in Juneau enabled me to stay in my hometown. I have also had the opportunity to visit my son in Hawaii." Huh? Anyone want to unpack that one for me?